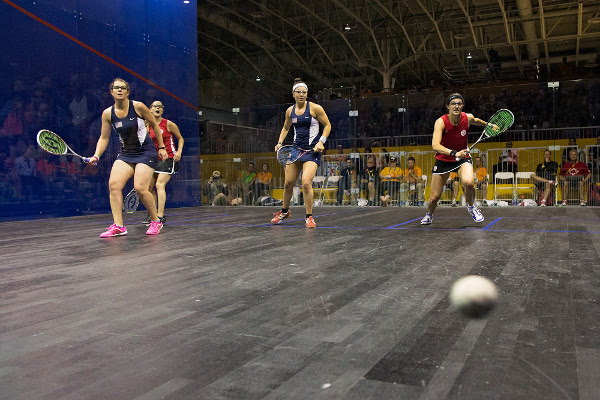 Colombian duo Andrés Herrera & Juan Vargas and US pairing Natalie Grainger & Amanda Sobhy were the unexpected gold medallists in the Pan American Games squash doubles championships at the Exhibition Centre inToronto, Canada. 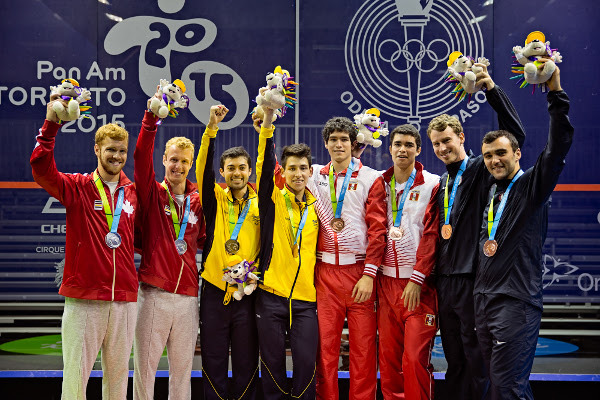 Herrera and Vargas, both unranked and making their PanAm Games debuts, began their shock journey to the men’s final after upsetting top-seeded Argentineans Robertino Pezzota & Leandro Romiglio in the quarter-finals. The unheralded pair went on to take out higher-seeded Peruvians Andres Duany & Diego Elias to set up a final clash with Andrew Schnell & Graeme Schnell, fellow 5/8 seeds from Canada. 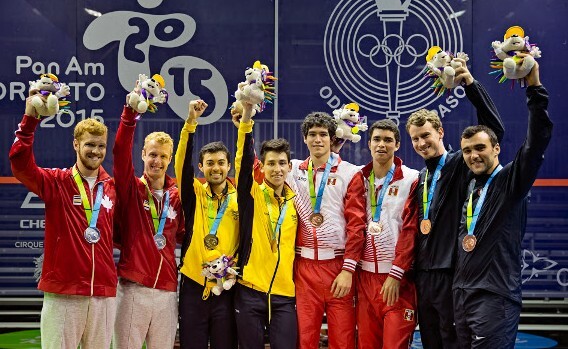 Herrera, 19, and 21-year-old Vargas (pictured above – in yellow – with fellow men’s medallists) took just 20 minutes to despatch Calgary’s Schnell brothers 11-6, 11-3 to claim Colombia’s second gold medal of the Games, following the men’s singles triumph by world No.4 Miguel Angel Rodriguez. 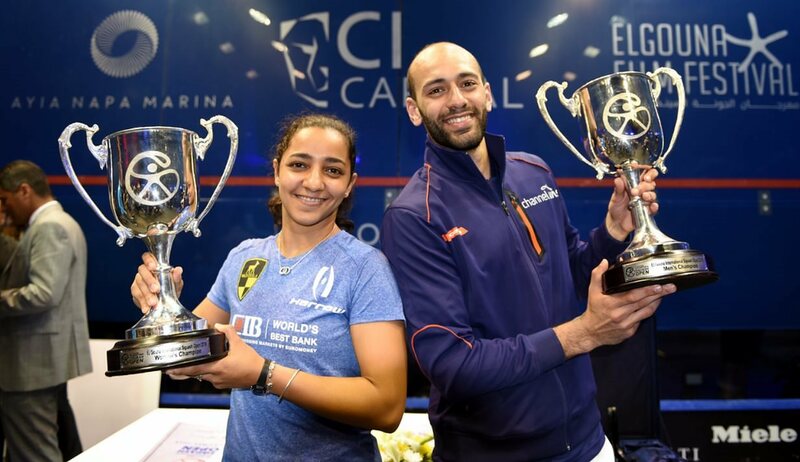 Grainger and Sobhy were unseeded in the women’s event – but wasted little time securing their place in the women’s final after beating Brazilians Tatiana Damasio Borges & Giovanna Veiga and second-seeded Colombians Catalina Pelaez& Laura Tovar. 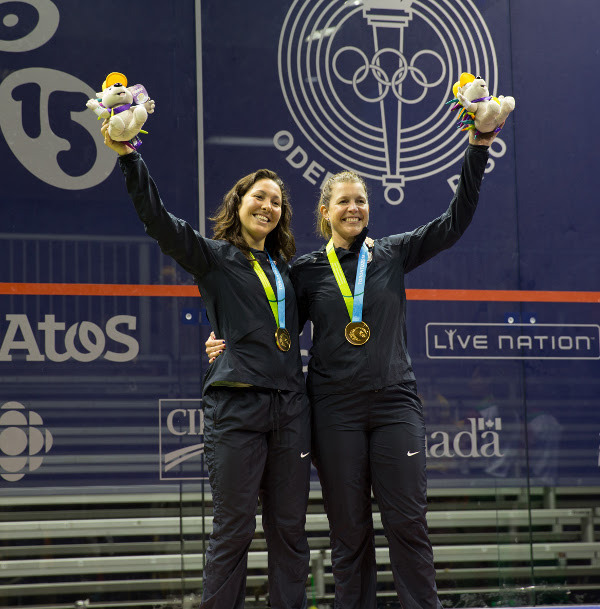 “It’s not often you finish a match you’ve lost and feel awesome,” said Canadian No.1 Samantha Cornett after she and partner Nikki Todd took the US pair the full distance before going down 11-9, 9-11, 11-6. 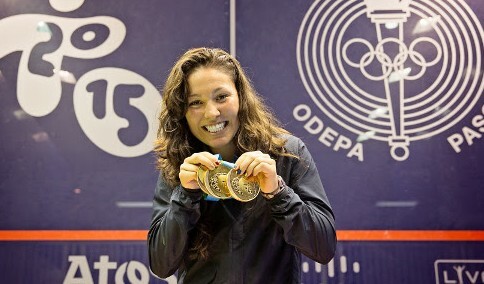 The triumph provided a second PanAm Games gold medal for both US partners (pictured above) – 38-year-old former world No.1 Grainger adding to her singles success in Brazil in 2007, and Sobhy, the 22-year-old world No.10 from New York, claiming her second in 24 hours after her Toronto singles title success.